Mar iar-Aire Gaeltachta, chuir sé gliondar ar mo chroí an lá a foilsíodh an Straitéis Fiche Bliain don Ghaeilge. Is fada obair ar bun ar seo ach creidim féin gur lá cinniúnach eile don Ghaeilge í seo. Tá go leor dul chun cinn déanta ag an nGaeilge le fiche bliain anuas agus tá súil agam anois go mbeidh rath i ndán don teanga. Ar ndóigh bhí sé de phribhléid agamsa a bheith mar Aire Stáit agus mar Aire Gaeltachta le beagnach 13 bliain anuas agus rinneadh rudaí san am sin a mbeidh tábhacht leo don teanga go ceann i bhfad. Orthu siúd bhí Coimisiún na Gaeltachta, Acht na dTeangacha Oifigiúla, bunú Oifig an Choimisinéara Teanga, Stádas Oifigiúil don Ghaeilge san EU, Ráiteas an Rialtais i leith na Gaeilge 2006 agus anois an Straitéis Fiche Bliain. Tar éis nach n-athraíonn aon cheann acu seo staid na Gaeilge thar oíche, níl aon cheist ach go bhfuil tionchar fadtéarmach acu ar leas na teanga. Má bhreathnaítear ar staid na Gaeilge ag deireadh an 19ú aois agus an seasamh atá aici i measc an phobail anois, de réir taighde an Athar Mac Gréil, feictear athrú mór. Ag deireadh an 19ú aois, ní raibh ach 1% den phobal aonteangach Béarla. Ba é an patrún a bhí ann ag an am ná, má bhí pobal aonteangach i nglúin amháin agus sa gcéad ghlúin eile, dátheangach, go raibh siad aonteangach Béarla sa tríú glúin. Bhí díothú na Gaeilge ag tarlú chomh sciobtha sin. Ní raibh meas ar an nGaeilge ná ar Ghaeilgeoirí agus chonacthas iad mar dhream bocht ar an imeall. De réir an tsuirbhé náisiúnta a rinne an tAthair Mac Gréil le gairid, tá seasamh ard ag an nGaeilge agus ag Gaeilgeoirí agus, ar ndóigh, is ionann stádas a bheith ag teanga agus rath a bheith ar theanga. Chomh maith leis sin, tar éis gur tháinig meath ar an nGaeilge sa Ghaeltacht le céad bliain, bhí an meath sin thar a bheith mall le hais mar a bheadh murach go raibh seasamh ag an nGaeilge mar theanga oifigiúil. Ar ndóigh, is é atá i gceist leis an Straitéis Fiche Bliain ná plean cuimsitheach rialtais ag a mbeidh lántacaíocht an stáit leis an nGaeilge a chur chun cinn taobh istigh agus taobh amuigh den Ghaeltacht agus, don chéad uair, tá plean comhtháite againn leis an nGaeilge a chur chun cinn. Tharla go raibh mé ag léamh bileoige a scríobh mo sheanathair Shán Ó Cuív sna tríochaidí faoin teideal “The Problem of Irish in the Schools” le gairid. Bhí cúpla rud a dúirt sé sa leabhrán seo a chuir mé an-spéis ann. An chéad cheann a thaispeánann cé chomh leochaileach agus a bhí an teanga ná seo - “Anybody who can recall the Ireland of 1897 will know what I mean. The Gaelic League had been in existence for four years, but it might as well have been a Yiddish league for all the influence it had on the public life of the country.” Téann sé ar aghaidh agus míníonn sé go raibh feachtas láidir maidir le cúrsaí airgid idir Éirinn agus Sasana ar bun ag deireadh na naoú aoise déag. Bhí mo sheanathair gafa leis an bhfeachtas seo agus chuaigh sé chuig cruinniú i gCorcaigh ag ceapadh gur cruinniú faoi chúrsaí airgid a bheadh sé, ach tharla gur faoi chúrsaí teanga a bhí sé. Seo mar a scríobh sé. “My first consciousness of this new movement was due to a lecture delivered in Cork by An tAthair Peadar Ó Laoire. It was in the days of the financial relations agitation and the title of the lecture was: ‘Some Losses we have Suffered’. Like many others who went to the lecture, I expected to hear a case stated for financial justice for Ireland. I was soon disillusioned. “Who steals my purse, steals thrash”, said the lecturer; “who steals my language, steals my soul”, or words to that effect. Is dóigh liomsa go bhfuil sé thar a bheith tábhachtach go bhfeicfimis freisin go bhfuil tábhacht leanúnach fhadtéarmach ag baint le cúrsaí cultúrtha agus cúrsaí na teanga. Tá sé tábhachtach freisin go dtuigfimis go n-imeoidh na fadhbanna airgid ach mura leanaimis linn ag forbairt na teanga, d’fhéadfaimis í sin a chailleadh agus ní bhfaighimis ar ais go brách í. Tá sé chomh maith freisin tuiscint, tar éis go raibh lochtanna ar an méid a tharla le céad bliain i dtaobh na teanga, go bhfuil sár-dul chun cinn déanta agus go bhfuil bunsraith iontach le tógáil air. Cheapfainn féin, dá gceapfadh an dream a thug faoin teanga a shlánú ag deireadh an 19ú aois, go dtiocfadh saol ina mbeadh an Ghaeilge mar theanga oifigiúil oibre san Eoraip, mar chéad teanga náisiúnta sa tír seo, go mbeadh teilifís Gaeilge ann, Raidió na Gaeltachta ann srl., go mbeidís sásta go raibh toradh ar a gcuid oibre. Má leanann muidne linn, ag tógáil céim ar chéim ar a bhfuil bainte amach le céad bliain, éireoidh linn an teanga a threisiú mar atá ráite sa Straitéis Fiche Bliain agus í a dhéanamh ina gnáththeanga cumarsáide sa tír seo. 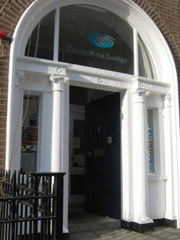 Tá spriocanna maithe sa straitéis maidir le líon na gcainteoirí laethúla Gaeilge, taobh istigh agus taobh amuigh den Ghaeltacht, faoi cheann fiche bliain. Seo eochair na ceiste anois, i.e. go mbeadh an teanga i ngnáthúsáid ag gnáthphobail na tíre, gach lá den tseachtain, i ngach gné den saol, i ngach áit sa tír. Go mbeadh sé ag treisiú sa nGaeltacht ach gur rud coitianta a bheadh sa nGaeilge in áit ar bith sa tír. Dar liomsa, tá sé fíorthábhachtach an Ghaeltacht a threisiú ach nach féidir leis an nGaeltacht maireachtáil gan an Ghaeilge a bheith láidir in áiteanna eile sa tír. Tá sé thar a bheith tábhachtach go mbeidh an bhéim ar an nGaeilge a sheachadadh ó ghlúin go glúin taobh istigh den teaghlach. Tá sé tábhachtach freisin, nach mbainfeadh an Ghaeilge amach anseo ach le dream beag amháin ach go ndéanfar cinnte gur le pobal uile na hÉireann í. Sin é an fáth go bhfuil sé thar a bheith tábhachtach nach nglacfar le polasaí Fhine Gael agus Pháirtí an Lucht Oibre nach mbeidh an Ghaeilge mar bhunábhar tar éis an Teastais Shóisearaigh. Ní ceart cultúr agus oidhreacht tíre agus an chéad teanga oifigiúil a cheilt ar ghasúir na tíre. Caithfear feachtas láidir a chur in éadan na dúnghaoise seo agus seasamh leis an ngeallúint atá sa bPlean Fiche Bliain go múinfear an Ghaeilge ar ardleibhéal le curaclam nua go leibhéal na hArdteiste do gach dalta scoile. Creidim féin go mba cheart go mbeadh an Ghaeilge, an Béarla agus an Mhatamaitic mar bhunábhar scoile suas go dtí an Ardteist. Cén tír eile a déarfadh go raibh oideachas curtha ar dhaoine agus gan na teangacha oifigiúla a bheith múinte do scoláirí na tíre sin! Agus deireadh ag teacht le tréimhse an rialtais seo, tá súil agam, pé ar bith rialtas a thiocfaidh i gcumhacht ina ndiaidh, go mbeidh sé le rá acu siúd faoi cheann cúig bliana, go bhfuil an oiread déanta acu siúd don Ghaeilge agus atá déanta ag na rialtais a bhí ann ó 1997 i leith.